Showing gratitude is one of the bases of friendship. Acts can overcome shyness. Soon, though, he began feeling a terrible itch; first in his gills, and then in his fins, and then all over his body. 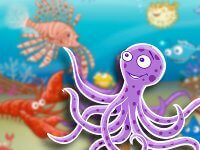 It turned out that this giant fish had a very artistic nature, he adored colours; and the octopus's dark ink had given him a terrible allergy!! So the big fish swam away, irritated all over.